Who else finally bit the bullet and embraced the winter the only way possible - by drinking a steaming hot mug of hot cocoa? ✋✋✋ I definitely did. Drank my first cup last night and it was sublime. I’ll admit, it wasn’t homemade ((because sometimes Swiss Miss is just everything - that blue box, with the alps in the back, just gives me all the feels)), but I doctored it up with a little bit of Kahlua, some Amaretto and cream. Yah, to some it’s a Toasted Almond, to me, it’s a Toasted Elf :) Credit to my sorority sister who shared this genius with me 5+ years ago and I’m still sipping it season after season. Boozy cocktails on your radar now that I’ve mentioned Kahlua? Check out 15 fall cocktails to try! I’m a huge cocoa fanatic, and my fam knows too, because every year, I get some new kind of cocoa to covet and essentially curate for the winter. The mix comes in some sort of metal tin, nostalgic AF, and their smell is intoxicating. It’s one of those stocking stuffers I still get excited about at 29 years old. 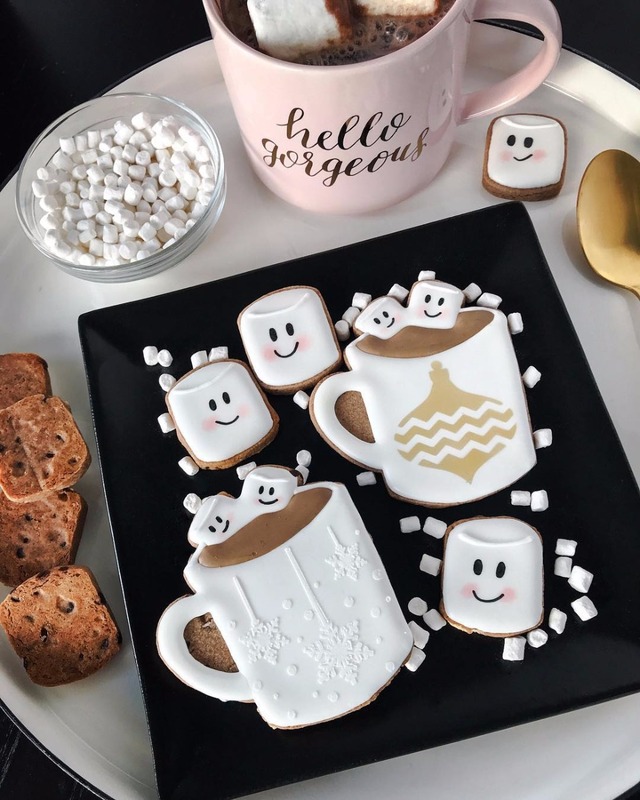 And while marshmallows and whipped cream, chocolate shavings and snowflake sprinkles have replaced the sugar-plums dancing in my head, I’ve satisfied my cravings by double-tapping some of the prettiest cups of hot chocolate on Insta - as one does this time of year. Call us crazy, but we’re hoping the glitter cappuccino trend takes over cocoa too. Espesh for that unicorn-inspired white hot cocoa one! You don’t have to be a barista or one of the most on-point pastry chefs in the game ((@jennaraecakes = 💕💕💕💕)) to make your hot chocolate haute this season. Just take a peek at some of the recipes and sinful stir ins we’ve been sampling, they’re too good to pass up. Some of these would be great to cozy up and drink down with your man, too!